Panaeolus acuminatus grows in grass and manured areas across North America, and can be separated from similar species of Panaeolus by its very long and very thin stem; the absence of toothlike fragments on the cap's edge (see Panaeolus papilionaceus); and microscopic features (see below). Panaeolus foenisecii is very similar but has a stouter stem and, under the microscope, wrinkled spores. Ecology: Saprobic; growing alone or scattered in grass, manured areas, and on dung; spring, summer, and fall; widely distributed in North America. 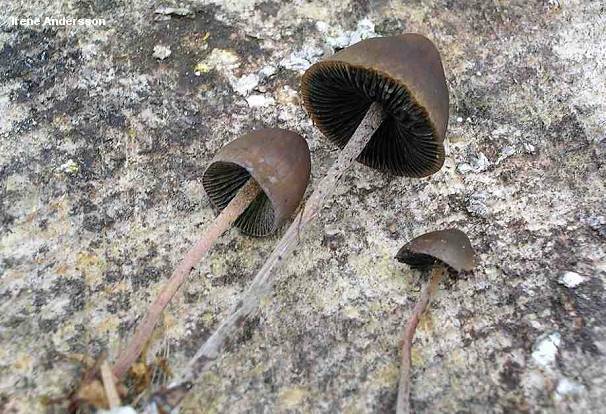 Cap: 1-2 cm; fragile; at first sharply bell-shaped; becoming broadly conic, broadly bell-shaped, or convex; dry; smooth; dark brown, fading to grayish; changing color markedly as it dries out, with two-toned specimens commonly encountered; the margin finely lined, lacking partial veil fragments. Gills: Attached to the stem, or pulling away from it with maturity; close or crowded; grayish when young, but soon developing black areas and acquiring a mottled appearance; often with whitish edges; eventually black overall. Stem: 8-12 cm long; only 1-2 mm thick; equal; finely hairy; often brittle; pinkish to reddish brown, or colored more or less like the cap; darkening toward the base with maturity or on handling. 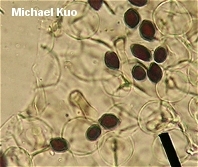 Microscopic Features: Spores 11-16 x 8-11 µ; smooth; lemon-shaped; with a pore; dark reddish brown in KOH. Pleurocystidia absent. Cheilocystidia fusoid-ventricose to irregularly cylindric; to about 35 x 10 µ. Pileipellis cellular/hymeniform, with pileocystidia. REFERENCES: (Schaeffer, 1774) Quélet, 1874. (Saccardo, 1887; Stamets, 1978; Smith, Smith & Weber, 1979; Ola'h, 1969; Weber & Smith, 1985; Gerhardt, 1996.) Herb. Kuo 10190702.